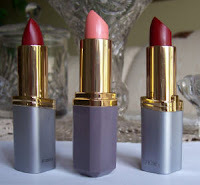 Stella Arnaldo's Blogspot: Lead in my lipstick? Eeek! ATLANTA - Lipsticks tested by a US consumer rights group found that more than half contained lead and some popular brands including Cover Girl, L'Oreal and Christian Dior had more lead than others, the group said on Thursday. Read the rest at ABS-CBN. First, kids dying from lead in toys. Now, they find high levels of lead in lipsticks. What's next - lead in food? Are women going to start dying now too from using lipstick too much?